Microsoft Is The Worst Security In The World!! Can you guess which vendor is ‘feeble’ at protecting businesses from malware? Respected anti-malware testing authority AV-Test.org has published its latest report – comparing the performance of 11 different enterprise anti-virus products designed to protect Windows 7 users. And, in the main, the products performed very well. 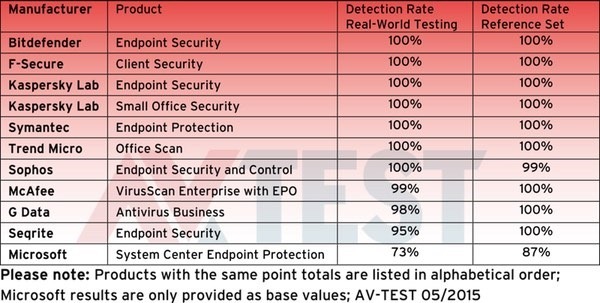 In fact, products from Bitdefender, F-Secure, Trend Micro, Symantec and Kaspersky managed an impressive 100% detection rate in a “real-world” test against new, still unknown threats and a separate test against an AV-Test.org library of nearly 30,000 already known malware samples. Even the products which didn’t quite manage 100% in both tests, still performed very well. However, there’s one fly in the ointment. One (rather well-known) software company that AV-Test.org included in its Windows 7 test, and found somewhat lacking… Microsoft. Thorough tests like this by independent experts are important, because over 60% of the Windows PCs used by businesses are running Windows 7. (Approximately 22% are running Windows 8.1, and a worrying 18% are said to be still risking everything by using Windows XP). The solutions from Seqrite and the security module from Microsoft, tested for comparison, made a considerably weaker showing. While Seqrite still did a respectable job in detecting malware, it slows down the clients much too heavily in the process. The freeware Microsoft module is much too feeble in the detection of malware. 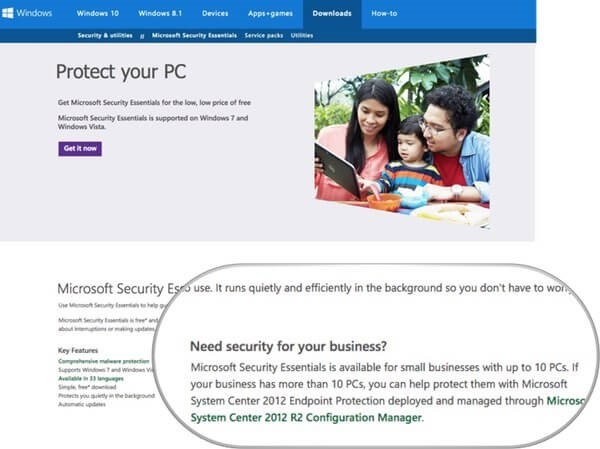 On its website, Microsoft continues to recommend Microsoft System Center 2012 Endpoint Protection to business users. Maybe, in light of test results like this, Microsoft would be doing a better service to more actively promote solutions from third-party vendors instead. Remember folks – price should not be the driving factor when you decide which anti-malware solution you’re going to use to protect your business. Security software’s performance and the quality of the service you receive should be much more important than whether your business is going to have to write a cheque or not. Ultimately, an anti-virus which isn’t doing a good enough job of stopping the malware could well cost you more in the long run. Find out more about AV-Test.org’s test here. This entry was posted in Uncategorized and tagged Microsoft Is The Worst Security In The World!!. Bookmark the permalink.